So, we all know about Africa’s Big Five - three words that belong to Africa as much as Kilimanjaro and big skies. Originally the term ‘Big Five’ meant the five animals that gave their hunters the most difficulty because of their unpredictable behaviour – Lion, Leopard, Black Rhino, Buffalo and African Elephant. These days, the list now used for sightseeing tourists (and rightfully so). Like Africa’s Big Five, the Great Barrier Reef’s Great Eight is the underwater equivalent - it’s not only a checklist of the reef’s most stunning marine creatures but a great way to ensure you see all manner of other wonderful fish, coral and sea life along the way. So grab that camera, and get ready to play Great Eight Bingo! The delightful clownfish, aka Nemo, really needs no introduction. A little shy and skittish, Nemo is as synonymous to the Great Barrier Reef as the reef’s other famous celebrity, Sir David Attenborough. Nemo can be found mostly in shallow lagoons darting in and out of the stinging tentacles of anemones. With lips to rival Angelina Jolie, this beautiful big-boned behemoth of a fish has the most curious of personalities and is not shy in approaching divers and snorkellers. Clocking in at more than two metres long and weighing more than a human, this gentle giant is playful and destined to be your new BFF on the reef. Often found hanging about the pontoons, scoping out the talent. Preferring a slightly more homebody lifestyle, Giant Clams find a spot on the reef and attach themselves for the rest of their life. With a lifespan of around 100 years, these giants outlive most humans! Although rough on the outside, the inside is a spectacular marbling of kaleidoscope colours. Like a fingerprint, no two clams have the same mantle colour and pattern. Can be found skulking in amongst coral reef shelves. 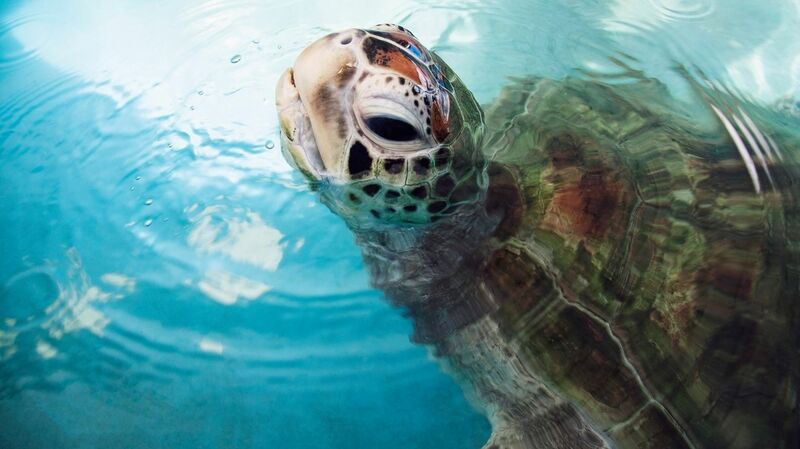 With six of the world’s seven turtle species having a Great Barrier Reef address you’ll likely spot turtles whenever you’re exploring the reef. These loveable creatures are also not shy, happily darting in and around divers and snorkelers, especially in the shallower waters as they need to be near the surface to breathe. Mostly found off islands and coral cays, likely the same place where they hatched as babies. The acrobats of the ocean, these graceful creatures can grow up to 7m in diameter and are certainly the hipsters of the underwater community preferring a mostly vegetarian diet of phytoplankton. Unlike other rays, manta rays have no stinging barb and are completely harmless to humans. The Heavyweight Champion of the Sea, the Potato Cod is part of the Grouper family, and regularly weighs in at around 200kg. That’s a lot of fish fingers. Though you could be lucky enough to see a Potato Cod diving anywhere on the Reef, the best place to see this gentle giant is at the ‘Cod Hole’ in the Outer Reef near Ribbon Reef #10. At the top of the food chain, a great variety of sharks call the GBR home. Many different varieties exist in harmony, ranging from harmless bottom-dwelling sharks, like wobbegongs and reef sharks, to larger types, like tiger, hammerhead and the whale shark. The Big Daddy of the Great Eight, the Great Barrier Reef is a marine playground for humpback whales and their calves. Their annual migration north from the Southern Ocean sees them tail slapping high fives like a boss from June until September on the GBR. Their smaller and more bashful cousins, dwarf minke whales, are often spotted in the warm waters of North Queensland around June or July.